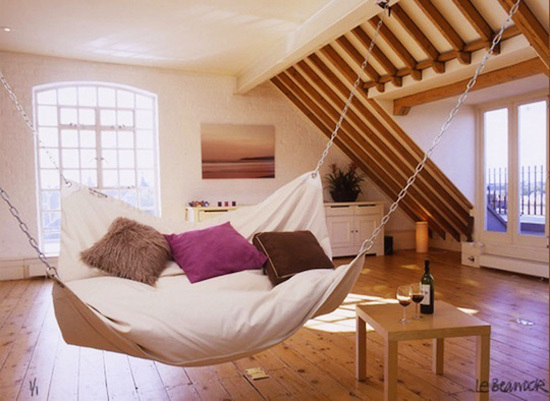 Isn't this hammock bed from Le Beanock rad!? It's funny because my husband was just talking about how he wanted us to start sleeping in a hammock instead of a bed. But, all I could picture was me being claustrophobic and the hammock folding up like a taco with us trapped inside. I nicely told him I wasn't too sure about the idea, then I about had a cow when I stumbled upon this image. I had no idea queen sized hammocks even existed, and this one actually looks comfortable and functional. I want one. and I agree with abe. i think i'll have to start it too.